Many of our customers, especially those with high speed applications, have been asking: can you make the screws any quieter? Recently, Steinmeyer delivered an answer: the Quiet Series, featuring an innovative end cap that reduces noise by 50%. Meanwhile, on the design side, the innovative plastic end caps provide a solution for small diameter screws. 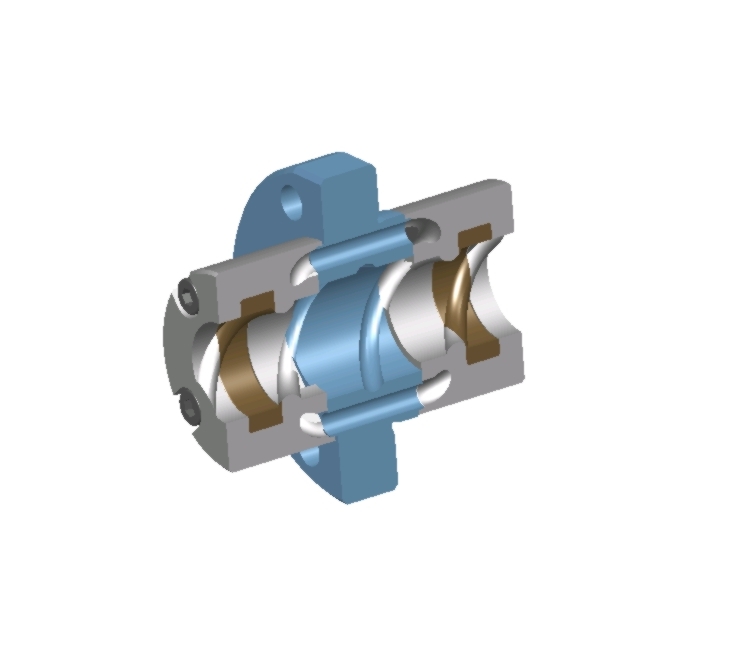 As shown in the 3D drawing below, the steel body (blue) has an integrated flange and “through the nut” ball recirculation. The plastic end caps (gray) provide quiet return, and may also include integrated combination wipers (not shown). Quiet Series screws are designed typically for a lead/diameter ratio greater than 0.5. Due to the high lead, they are especially well-suited for use in high speed pick-and-place actuators. The screws are available in diameters from 5 to 20 mm and leads up to 32 mm! All feature dual start threads, P5 accuracy grade, and ball nuts with zero or minimum axial play. So, if you are running a high-speed application and your current ball screws are too noisy, contact Steinmeyer and ask about our Quiet Series. We may have an ideal solution that gets you running quiet. In the Steinmeyer view of ball screw design, a double nut is always associated with 2-point contact. The advantages of 2-point contact are numerous: lower friction, more consistent torque, higher stiffness, and longer life. In much the same way, 2-point contact can be achieved in ball screws having 2 thread starts. In this case, there are 2 ball circuits, one in each thread start. The corresponding threads in the nut can be offset, thus creating the desired 2-point contact. With UNILOCK, two separate nuts are preloaded against each other and locked together with special epoxy to form an oil tight connection. The result is a compact, cost-saving design that requires no spacers or shims and resists both moments and side forces. The UNILOCK double nut is nearly as compact and stiff as a single-piece design. As a rough rule of thumb, if the Length/Diameter ratio is greater than 20, then double nuts are often preferred. However, the final choice must consider the details of your application and cost requirements. Please keep in mind that our proprietary ETA+ technology is not available for single nuts because it requires a minimum length. Steinmeyer engineers can recommend a variety of potential designs.